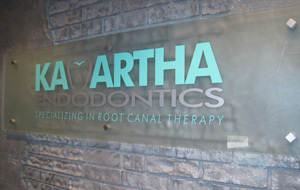 Thank you for your interest in Kawartha Endodontics, a dental practice dedicated exclusively to endodontic care. We look forward to being of service to you. Our team, led by endodontic specialist Dr. Kilislian, includes an experienced endodontic team. We provide professional care in a friendly, comfortable environment. We hope that the information provided here answers many of your questions about endodontic treatment. Our practice is prefers to use technology to optimize the outcome of procedures, frequently treating the most complicated cases, in an effort to prevent loss of teeth, when the necessity of extraction seems imminent. The atmosphere is calming, soothing and relaxed. The team is pleasant, and we aim to ensure that the experience is always less traumatic than whatever the patient might have anticipated. Dr. Kilislian's motto is, "A patient in pain needs you yesterday, not tomorrow, therefore, see them as soon as they call to handle their pain problem. And that’s what we do.” Our 24 hour emergency line is 705-772-9070 or 911@kawarthaendo.com. providing Root Canal Therapy, Endodontic Retreatment, Apicoectomy - Endodontic Surgery, treatment of Traumatic Injuries and Cracked Teeth.